2019 is going to see a significant leap in the current digital India trends. Some of the technologies are already going mainstream. These life-enhancing smarter technologies will further boost our productivity and enhance our daily living conditions. On the other hand, industries like healthcare, manufacturing, education, and agriculture are few of the many domains that will integrate such technologies in their operations. 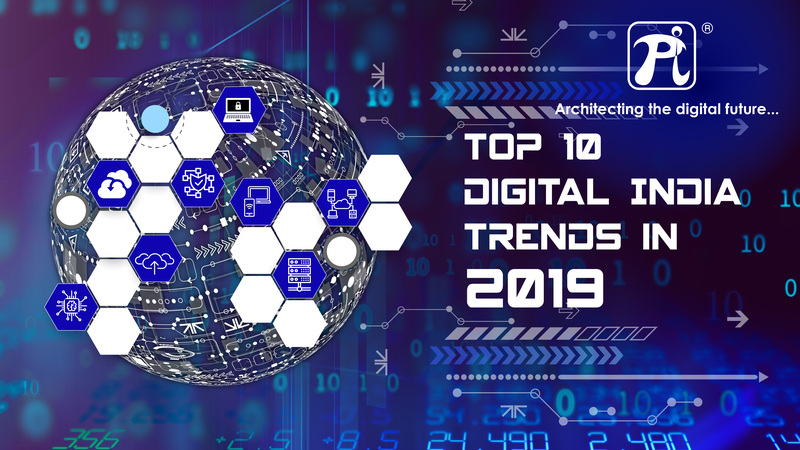 Among the top ten current emerging technologies listed below, Cybersecurity continues to take the center stage of all digital India trends 2019. 2. Data Sovereignty – While data privacy takes the centre stage, factors such as the growing economy of India, the influence of data on the future of the country, and data localization has become very relevant and critical. Governments and other enterprises such as digital payment applications, social networking and all other sectors that uses personal data have come under the radar and scrutiny of such regularizations. Governments all over the globe are increasingly planning and passing newer data privacy regulations, similar to General data protection regulation or GDPR, in Europe, imploring companies to be compliant. Simultaneously, users are equally careful in guarding or removing information about themselves. Hence, companies must gain and maintain trust with their users/customers to succeed if not, will fall behind their competitors. 3. Data Center Infrastructure as a Service – DCIaaS is another key future technology. Outsourcing of datacenter, hosting and operation services will transform significantly both in enterprise and public sector given the complex challenges of building and managing datacenter by the enterprises themselves citing the associated costs. On a brighter side, this will enable faster customer interactions, better customer services, and enhanced customer and user experience. Come 2019, both local and global companies will start using high-quality 3rd party datacenters that can provide data center infrastructure and deliver end to end services. 4. Cloud Adaption Acceleration – India, as a nation, has one of the faster adaption rates at using devices such as desktops. laptops, smartphones, and broadband internet. Similarly, the path to adopting cloud-based technology is also expected to be at a faster rate. Both private and public enterprises today have already begun adopting cloud first strategy which was uncommon in India until two years ago. However, most of today’s cloud-ready applications, their lower operating costs and, quick time to market are playing key roles in imploring Indian enterprises to shift to the cloud at a rapid rate. 5. Disaster Recovery Readiness – A recent report from Gartner’s 2015 Business Continuity survey stated that 72 percent of firms that implemented DR had to utilize their IT disaster recovery plans. The report also suggested that most of the disasters are either operational failures such as power failure, IT hardware failure or were human-caused events. This causes a staggering impact of downtime and demonstrates how critical it is to plan for disaster recovery readiness from a business continuity perspective. Hence, DR is considered a must-have. However, a combination of regulatory requirements and awareness of data protection and the underlined criticality is driving enterprises to adopt DR strategy. 7. CDN Rapid Adoption – Using CDN, enterprises are not only looking for network acceleration but also clean and secured data. The content is replicated throughout the CDN, so it exists in many places altogether. It simply means that a client can access a copy of the data nearer to his location rather accessing it via a central server so to avoid bottlenecks near that server. Moreover, watching original content like movies and live sports are becoming mainstream by millions of users simultaneously, imploring adoption of CDN services by both content and the service provider. 8. Artificial Intelligence – Artificial technology is already a buzz among people and companies alike. AI relates to computers systems built to mimic human intelligence and perform tasks such as recognition of images, speech or patterns, and decision making. Additionally, it can perform these tasks faster and more accurately than humans. AI, like everyone perceives, is feared to be the reason behind potential job loss. As believed, but will create more jobs rather eliminate manpower, especially, in the field of development, programming, testing, support, and maintenance etc. 9. Blockchain – The year 2019 will take blockchain mainstream. Blockchain refers to a constantly growing list of records called blocks, which are linked and secured using cryptography. In simple terms, Blockchain is described as the data you can only add to, not take away from or altered in any way. The feature of not being able to alter the previous blocks is what makes it so secure and preferable by technology-centered organizations. 10. Internet of Things – IoT has been one of the promising and smarter technology to have made its mark as early as 2014. IoT enables devices, home appliances, cars and other daily used devices to be connected and exchange data over the Internet with ease. The increase in the number of IoT devices keeps soaring massively year after year and it sure looks like IoT’s not going to slow down or back off anytime soon. Its prime features such as enabling better safety and efficiency make it the most preferable technology. IoT helps businesses by analyzing the collected data constantly easing the companies to make timely and wise business decisions. It further enables predictive maintenance, accelerates medical care, enhances customer service as well. Digital transformation continues to evolve and impact all businesses & industries. Some of these technologies carry maximum potential and transforms our ways of working, socializing, and interacting and their implications which will continue to have a larger and positive impact on all of us not just in the coming year but far and beyond 2019.